Clay Collins is the Cofounder & CEO of LeadPages. He comes from a marketing and copywriting background where he has helped other companies with creating successful marketing campaigns for years. Fun fact: He started his first software company at the age of 15. Tim: Welcome to the 100th episode of ConversionCast. I’m thrilled to have made it this far and just wanted to take a second to say thank you so much for listening, subscribing, sharing and for all of the incredibly kind emails and comments and person about the show. It is my absolute pleasure to get to host this show and I’m glad that you’re enjoying it. So with that said, we wanted to make the 100th episode incredibly special and bring a very special guest on. So who better than our very own CEO here at LeadPages Clay Collins. Today we’re doing a deep dive into the growth hypothesis Clay had in the very beginning of LeadPages. Knowing that we were a bootstrap startup, Clay knew we couldn’t afford the extremely high customer acquisition costs that many large SAAS companies have incurred. So he wanted to know is it possible for a small content marketing team to outperform a huge sales team. Now if you’ve been keeping up with the company, you already know the results including the fact that we landed number 220 on the INC 500. But the beautiful part of this episode is that Clay is going to break down the specifics of his thesis and how to actually set the strategy in motion so you can win. It’s the perfect discussion for our 100th episode and I know you’re going to love it so let’s go ahead and get into it. 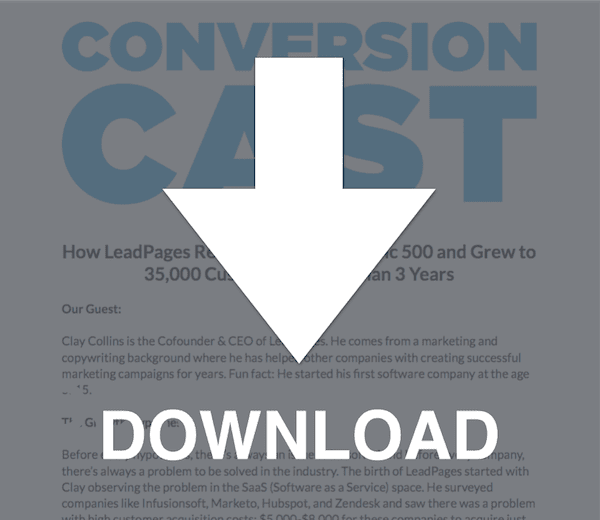 I’m Tim Page, the conversion educator here at LeadPages and this is the 100th episode of ConversionCast. Hey Clay, welcome to ConversionCast. Thanks for coming back on. Clay: Tim, I am happy to be here. Thanks for having me on the show. Tim: Absolutely it’s great to have you back. You know we’re celebrating the 100th episode of ConversionCast and it’s amazing to think that you know, we had this idea, you and a long time ago talking about what we’re going to do. We’ve come this far. We have gotten to 100th episodes with some incredible guests. You were one of the first and we felt like it would be great to have you back on and talk about just some of the things that we’ve done that has taken LeadPages to where it is now which is a pretty impressive place. So first off, why don’t you share with us kind of the foundation for what we’re going to talk about in this episode? Clay: Yeah. So recently we were appointed or got a place on the INC 500 and I believe that place is 220 or like 221 something around there. Clay: We’re going to talk about kind of like the growth hypothesis and the set of assumptions we made and the ideas we had about how we were going to engineer this outcome and how we went about this systematically. Tim: Yeah and it’s cool because I know we’re going to talk about kind of some specific things that we can do. We’re going to get a little bit of an overview and then and kind of how to do these things. So why don’t we just get into it? So what was the hypothesis there? Clay: Yeah. So this really started off with a big hairy problem which is what this hypothesis was response is. So I was looking around back in the day at SAAS companies. Other B2B SAAS companies in our space like Infusionsoft, Hubspot, ZenDesk, Marketo, etc. In many cases, I was seeing that the customer acquisition cost for acquiring customers with these companies was often in excess of $5000 and approaching 8 or even $10,000. So HubSpot recently released their S1 filing prior to going public which they have an and they noted that it cost them over $10,000 to acquire customers, about $11,000 for HubSpot to acquire a customer. What this means is that the payback period on that customer acquisition for HubSpot is over two years. So if you spend $11,000 to acquire a customer, that customer needs to be on Hubspot and use it for over two years for in many cases for HubSpot to make its money back. The same with ZenDesk and you know, this all depends on the economics in which plan you’re on but same with ZenDesk. The average, the last I read the average payback period on the CAC, on the customer acquisition cost is about 2.5 years for ZenDesk. So if you take all the money that you spent on paid media, hiring sales people, sales development representatives, marketing budget, all of that, you lump together you know, and paying down that cost like if it’s kind of debt. So paying down the debt on customer acquisition is about 2.5 years for ZenDesk. I just knew that LeadPages wasn’t going to be able to spend that much to acquire a customer. It just wasn’t possible for us as a boot strapped business at that time. The reason for that is because you know, when you have such long payback periods, more success means that you’re going further and further in the whole right. So if you’re spending $11,000 to acquire a customer, it takes again let’s say two, two and a half years to pay back that customer acquisition cost. But you know, LeadPages is almost over just two and a half years right now. So it would have taken us that amount of time for the first customers, you know, for us to break even on them and then again the more customers we get, the more we’re actually spending on customer acquisition costs. So you end up in a scenario where the more successful you are, the more cash you’re burning. And we just had to find another way and that other way is the LeadPages growth hypothesis. Tim: Awesome and is that kind of common? I mean is that what based on what you know is that kind of the common practice? Is that so many SAAS companies and SAAS startups have such a high customer acquisition cost and you know, require a really long time to make their money back. Clay: Yeah that kind of scenario is common for B2B SAAS companies that are selling into medium sized business and enterprise. So you know workday but even ZenDesk and HubSpot and I don’t know what the exact numbers are in InfusionSoft but I imagine, you know they’re over $4000 to $5000 to acquire a customer. So that scenario is common. If you’re kind of at the lower end of the market, it is less. It is less common just because people can’t afford those numbers. And that math, the math eventually does work out. It’s just often you don’t know if it’s going to work out until it’s too late and you’ve burned whatever venture capital you’ve raised or whatever amount you took out of your retirement or whatever to fund your business. Clay: So yeah t is somewhat common. Tim: That being said, you know how do we get around that? What was the –you know, the thing that allowed us to not have to worry so much about such a high customer acquisition cost? Clay: Yeah. So that strategy is again the LeadPages growth hypothesis. And our thesis was this. I sort of thought to myself one day that I bet a content team, a content producing team as long as they were the right people, i.e., you and others on the marketing team, I bet a content team of four people could outperform an 80+ person sales team at most companies. And so that was –you know, that was the growth hypothesis. I thought to myself what if instead of and this is in the early stages of the business. We have sales people now but what if during the early stages instead of hiring a sales person, we hired a YouTube channel owner who could make videos for YouTube and post them on our blog about our product use cases, what it accomplished? Like could that person outperform by a huge margin the average sales person at Salesforce? The answer turned out to be yes. And then I was like well let’s invest more. Instead of hiring another sales person, which instead of hiring another sales person, let’s hire a blogger, someone to run the blog and to write copy again to see if we can do with our blog what we did with video. And that was Cat so it was like Jeff and then cat. And then it went well and then the next thought was well what if we did this with podcasts, right? And then that was when you came on board. And then the next thought was well what if we do this with webinars and you moved into that and we just sort of scaled this philosophy of content channel ownership? Because content is one to many. Right? Clay: And so we’re doing one to many selling, one to many direct sales marketing as opposed to one to one selling that you might do with the sales team and when you’re creating content, you’re often creating a flywheel. It’s scalable, it brings you hits from YouTube every single day. Every single ConversionCast episode you know, gets us traction day in and day out. So it’s this evergreen resource that can help us for the remainder of the business. So you build this content flywheel. And it turned out that this was correct, right? That these worked right and I think it worked because we hired the right people and I think we worked because we understood content strategy and I think a whole bunch of things were in place. But here’s the result of that strategy. You know we arrived at a CAC that was between 1 in 5% of the CAC of publicly traded SAAS companies. We ended up with the highest LTB to CAC ratio I’ve ever seen. So that’s lifetime value of the customer divided by CAC. So like let’s say it costs $100 to acquire a customer, and they spend a thousand dollars of the business right. That’s like an LTB to CAC of 10. So we got the highest LTB to CAC ratio I’ve ever seen in a business and an ever growing flywheel of content that I think get sales for us every single day and of course while we sleep in an almost immediate payback period. And that’s kind of phenomenal and we have what so many other marketing organizations don’t have the companies which is a marketing team that for the most part owns new revenue in the business. Of course our sales team is coming in and scaling up and they’re doing some really fabulous things over thee that’s working. So that was a fantastic outcome and it turns out that we were right. Tim: And is that part of the key then is that each person kind of owns their revenue numbers? I mean they have to – you know, we all have to kind of know what it is that our efforts are directly generating and how that’s working and be testing it and that kind of thing. Is that one of the biggest keys to making that work? Clay: — all this high pressure stuff. But I think that what’s important is that people feel responsible to a number and they know how that number is performing. And I think that kind of awareness you know, at its foundation at the DNA level of the organization can produce some really, really fascinating results. Tim: And it takes away that that feeling of well you know I did this, this and this last month so obviously we’ve got to be getting results. It’s a clear, easy thing to look at you know, and say here are the results of the podcast or the results of this or that. It makes it so much easier for us to own that thing and to know directly whether our efforts are working or not and then from there you know, we can pivot and make adjustments as needed which is really helpful. So I think you know, one thing that somebody listening to this might be thinking is you know, I’m at the beginning of my journey. Maybe I’ve got a few employees or ten employees and we want to start doing this. How does somebody begin this strategy kind of from the beginning? How do they start to develop a content team? Should they start with you know, a certain channel? Kind of what’s the story there? Clay: Yeah. I think the first thing to do is really document your hypothesis and your assumptions. So there’s a whole lot of people that just start blogging or just start producing content or like hey I hear content marketing is where it’s at. We should be doing this and they just start like randomly creating a whole bunch of content. As opposed to doing something like we did from a strategic perspective and saying alright this is the CAC of this kind of business. What kind of customer acquisition cost are we looking to have and what is a strategy for making this happen. Documenting those assumptions, measuring their CAC and knowing and tying revenue to individual channels and tracking with these. So I think the first thing is to actually think like a strategist rather than someone just you know, randomly throwing content at the wall and hoping that it translates into sales. That way, you know, you know hey did this content piece work? Did this content piece work? Did this thing you know, end up putting us in a good place? So you actually know on a month by month basis, on a week by week basis whether or not your hypothesis is confirmed or not. I think having that kind of feedback loop in place and monitoring it that way allows you to calibrate your systems and to adjust course if something doesn’t look like it’s working. Clay: You know, it says got – because there’s just way too much just kind of like random nonstrategic activity happening and I think that’s why a lot of marketing companies at larger organizations end up doing just kind of dumb things and they start focusing on all kinds of things like brand which is important but you know, it has to be put into perspective and of course you can invest in that more than everything else when you’re just getting started. But they start focusing on these things rather than on conversions and leads and what is your –you know, what do campaigns look like, what does your marketing funnel look like all that stuff. So I think just step 1 you know, get spreadsheet. Clay: Is a good place to start. And actually go through you know, think about who your target audience is and start like making assumptions about where they go, what are the biggest media channels in that space and potentially go there. So you know, if you’re in the real estate market, or if you are a dentist, a local dentist or whatever you’re doing. I’m trying to make this applicable to all things. But if you’re a dentist you know is it radio first? Is it YouTube? Is it social media? You know, and just start with one and master one rather than most people which is like they’re going to create a page and they’re on twitter and like once a month they put a post, a blogpost and they’re going to send out an email newsletter and it’s just like pictures of their dog or like. Like whatever. Like pick one thing first and master it. Or master it or give up on it and move to the next thing. But at first I would say get really, really good at one form of content delivery and then for us that was a blog but for a lot of other people that might be like an email newsletter only and for other people it might be a podcast. So I think it’s important to start somewhere. Tim: Yeah that was one thing I wanted to point is that you know I think you brought on team members but you had already kind of dialed in to an extent the blog and the videos that you were doing for the blog and that kind of thing. That was already something that was working for us and you brought somebody on to you know, kind of manage that and take that, you know, make that their own so that you could go to the next thing and the next thing. I think that’s a big key especially for small, small shops you know, or one person companies or ten person companies to figure out what they’re really good at, hire into that and move into other areas. That seems to be one of the things. Is there anything else that you know, might be important for somebody listening to try to implement this strategy? Clay: Yeah. So I think you brought up a couple important things. The first is that prior to hiring someone to do something, I did find the kernel of something that worked and then brought in someone else to scale it to master it. So we – I did invest you know, again we’re bootstrapped. We’ve got like four people at the time. I didn’t invest in our first marketing hire until we had something that worked and we knew that if we pour more gas on the fire, that the fire is going to get bigger. I think the second thing that is worth noting is that we really invested in our marketing team. So a lot of times people will come in and the amount they have in their head for how much they should compensate a sales person is like really high. But then when they think about their blog, they think about oh well just hire some English major out of college like straight out of college and you know or outsource this to a writer in a nonnative English speaking country or actually maybe that’s great if you do live in a nonnative English speaking country. But they’ll just like outsource it or it’s just like it’s this content thing, we need to do it. I’ll just, I’ll find someone to make blogposts. Like Clay’s [indiscernible [0:19:33] ] blog post like we’ll make them. So I think the first thing is like we paid content producers like sales people are compensated at other companies. So we did not try and scrimp on this. You know, it was really important to us. I think another thing is that we kind of adhered to this 80/20 rule for content. Which is that 80% of the content should be focused on educating people, giving them content that would stand on its own that would be valuable even if the product didn’t exist and then spend you know, 20% of your content or actually sometimes I think at 95/5 works. But you know, 80% providing huge upfront value and then 20% educating people about how that content applies to your product. So you know, we talked about this in our webinar sometimes but you know if you have a 5-minute video, you might spend four minutes of that video giving people pure content and then in the last part saying hey and if you would like to automate this, you know you can use this product or if you have a video on healthy foods to eat you might spend four minutes talking about healthy foods. In the fifth minute, you might say you know I’ve got a coaching program and I hope you implement this in your home help you lose weight, gain energy etc. So I think that it’s important to know what percentage of content should be pure content and what percentage is kind of like light selling. I see this, I see this in you know, kind of spread across our marketing organization so I think about the courses that Bob the teacher creates for us and the free Facebook advertising course. Right? It’s almost I mean that is like pure – that is like a course that I think people would be willing to spend $200 or $300 on. It’s got 11 videos. It’s got transcripts. It’s got a mind map. It’s got you know, audio only versions. Yeah we’re giving this away for free and then we are showing people about how to implement the strategies in that in LeadPages but it’s not like a hard sell. I think that’s a good approach is to create content that goes hand in hand with the product that you’re selling. Tim: Yeah and it really people appreciate that a lot and it doesn’t feel like you are like pulling the carpet out from underneath them. Like it’s just giving them lots of value, value that they could use on their own but then if they want to make it easier and they want to kind of be more effective with it, they can get your product. Tim: Yeah. I love it. Anything else that people need to know to implement this? Clay: Yeah. I think another thing that we did that became valuable later on is we got a paid media budget is we tracked the content pieces that worked and the content pieces that didn’t. And the content pieces that worked, we amplified them with paid media. Right? So let’s say you know were writing ten blog posts per week one of out ten just crushes it for us in terms of leads generated, in terms of shares, in terms of interest. Well that’s the one we’re going to promote on social media. You know, we’re going to buy Facebook ads on or Twitter ads on or you know Google Ad like whatever. So I think understanding the role of paid media which is to you know, use free content as a laboratory for what works and what doesn’t and then to add fuel to the fire with paid media. You know, rather than doing what most people do which is just start buying ads on something without having any kind of clue about how it’s going to work. Tim: Yeah and part of that strategy, part of the magic of it is that you know, that paid media is going to content itself. I mean sure we drive people to webinars and that kind of thing but you know, a lot of our paid media goes just simply to content which then obviously a lot of the times there is an offer or there’s you know, a content upgrade that kind of thing. But primarily the majority of our paid media goes to content right? Tim: And is there –you know, the big thought process behind that is just again we want to amplify the content that’s working for us just like kind of we’ve been talking about this entire? Clay: Yeah. I mean when you’re spending like 300 grand a month on paid media, you kind of want to derisk that investment right? So a good way to derisk that is to send people to stuff that’s already working. So I think phase 1 is to invest in content like you invest in a sales team. Like I would say if there’s a core thesis here or if there’s sort of a main thing coming out of this investing content like we invest in a sales team, I think the next place to go is or that you’re investing all these resources and content. So step 2 is turn every piece of content into a lead generation opportunity. So recently, I gave – well I guess it’s not so recently anymore it feels like I have no sense of time but that the other day, I gave a talk at Infusion Con. And I saw even that as a lead gen opportunity and I at the end of the talk, I ask people to text the word icon to 33444. And they opted in through our lead digits product and we got like a few hundred leads from that and you know, there’s a little over 200. So I turned even a speaking event like which is content that invested in that turned into leads and then that turned into sales. That is something that we do pretty religiously at LeadPages. I think you would be hard pressed to find a single piece of content that doesn’t give you the opportunity for a customized specialized opt-in opportunity that goes with that content. In fact like there’s a lead digit for conversion cast right? Tim: We’ve got our lead digits for the episodes, for the webinar absolutely. Clay: Yeah. You know, and that we use like our lead digits product, lead links, of course LeadPages but you know if it’s a podcast, you can use something like lead digits. If you’re giving a talk , you can use lead digits to collect leads. If you’re on a blog post you can use LeadBoxes. You know, if you’re sending people from paid media, you can send them to a lead page and I really think it’s virtually impossible for you to go to a piece of content that LeadPages has created without seeing us. Some kind of opt-in opportunity for a specialized opt-in thing that’s like specific to that content that’s custom made for that and you’ll often see much higher opt-in rates. So a blog often will get like you know, half a percent opt-in rate across the blog whereas a blogpost might have a 20 or 30% opt-in rate of people who come to that post who opt-in for some kind of lead magnet that’s specific to that blog post. So I think you know, if you’re investing in content that heavily don’t squander it. Tim: I agree and if you want to get some very specific examples and visual guide to exactly how to turn your content into lead magnets and grow your email list from that you can just text LeadPagesLive to 33444. Again that’s LeadPagesLive all one word to 33444. You will be registered for this Thursday’s live webinar at 3 pm eastern time. That will be yours truly hanging out with you and answering your questions and helping you grow your list. And of course you can get a great example of how that works from that. Clay: I swear to everyone listening that wasn’t rehearsed. Like I wasn’t [indiscernible [0:27:39]] Like it’s just so baked into our culture, into our marketing culture that like everything has some sort of lead generation event related to it. So that was just like off the top of his head because you know, that’s how we roll. Tim: And is that – and there’s I guess one last question to this and that is that another part of the key is that you know all that content creation hiring people in and investing in content creation, you know, you’ve always said that the biggest goal of all of that beyond getting new customers and that kind of thing the biggest focus has always been growing a list, getting new subscribers. Is that one of the biggest keys to the success of the company? Clay: Yeah. I think one of the things we do really well is we dog food our own products. So we use our own products everywhere all the time. You know, there’s – we’re not –you know, LeadPages isn’t only dependent upon the success of the product because it’s what we sell and it has to be good. But like literally we would not grow without our own products. Clay: So you know, fixing bugs, addressing issues, expanding the product line is incredibly important to us because we are – our marketing team is dependent upon it. Clay: So if we have an idea for growing the business, that utilizes the product, like that’s going high up on the feature list. So I think that kind of mentality is super important. So I think yeah, I think we not only dog food our products so there’s this notion in the product community of dog fooding right, eating your own dog food, using your own product, etc. I think we not only dog food our own products but I think we dog food our own philosophies and our own advice and our own courses. So many times, you know, like the Facebook paid media course or the lead generation courses these are courses that support people. Take that new people in marketing take. You know, so we’re consuming this and I think the goal of creating this content is not just to get customers. We hope that even if people don’t buy LeadPages, that their business will be better for all this content that we’re creating. So there really is – it really is a win-win content scenario where it is lifting up the marketing communities, it is making things biter. And it does generate a lot of leads for us. But I think that you know, I think tying investment and content to leads is really important like you just did but I also think you know, tying those leads into sales is also important. And that’s where in a lot of ways, you know, our sales message and our sales page comes into play, webinars come into play and also contact with our enterprise sales people come into play. Is you know, at the end of all this lead generation, you need follow-up sequences, you need sales messages. You need mechanisms that convert leads into customers. I think that’s probably the last piece of the puzzle. Tim: Totally and of course there’s not enough podcasts to talk about all of those things unless we have several hours. So if you want to learn all those things a great place is to go to our blog at blog.leadpages.net and you will find a ridiculous wealth of knowledge on pretty much how to do all of that and the ways that we’ve done it and our clients and case studies all over the place of specifically how to do those things effectively in our webinars. Of course all these hundred episodes of ConversionCast that we’ve now giving you some specific tactics to implement. So yeah. Clay: And I think also frankly your webinar on Thursday and I believe you also do it on Friday, but the webinar that you do is basically fleshing out a marketing plan around this thesis that we had. So you know, in the webinar, you know, I’ve heard that you don’t go into like CAC and LTV and like payback periods for like publicly traded SAAS companies and how to map content channels to specific numbers which maps to specific people. Like we don’t go through all of that because I think that’s probably a lot more high level than most people are ready for when they first get acquainted to us. But that is the strategy and this strategy is what has led to that very specific game plan that you teach on the weekly webinars. So I would really encourage folks if you’re interested in like the nitty-gritty of implementing this, I think the weekly webinar is a good place to see that. Clay: But I think that even if you don’t go to that you know, this podcast will help you out. Tim: Again to join that webinar, you can text LeadPagesLive to 33444 or you can head over to LeadPageswebinar.com and you’ll get to register there. Well Clay this has been awesome. I know that people right now their head is just spinning with all of the awesome stuff that they’re going to do. So thank you for being a part of this hundredth episode, thank you for being responsible for making this happen and thanks for sharing some awesome stuff on the show. Clay: Tim, thanks for crushing it each and every week. It’s a privilege to get to work with you and it’s a privilege to be on this podcast that you birthed was it like – how long ago was it? Tim: About 18 months ago now. Clay: 18 months ago. So it’s a privilege to be back on here. I think I was on here for the first episode and it’s a privilege to be here for the hundredth one so thanks for everything. Tim: Absolutely. Wow. How you doing? Need a breather? I don’t blame you. What an amazing discussion. I’m so stoked that we were able to do this for the 100th episode to have Clay back on the show. So thank you again for listening to us for all this time and I hope to see you on the webinar this Thursday at 3 pm eastern called How to Quickly Grow Your Email List Without Spending All of Your Time on Marketing. Again to join, just text LeadPagesLive all one word to 33444. Again that’s LeadPagesLive to 33444 or go to LeadPagesWebinar.com and of course we’ll see you next week on ConversionCast.